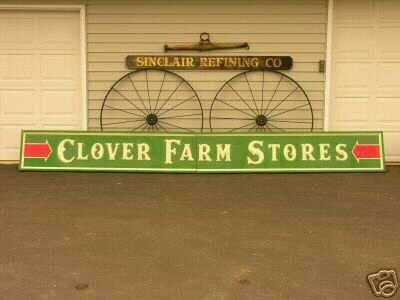 A whopping 16 feet by 2 feet, this Clover Farm Stores sign comes in two pieces. When the pieces are put together, it is all green with white text. To the left and right edges are two arrows pointing inward. This sign would have been hung above the Farm store that it was advertising.